If you do a Google image search on the myth of the Green Man, you’ll find loads of sculptures going back in time of a powerful man’s head intertwined with leaves and fruit, sprouting ivy and sometimes even snakes. Scary! 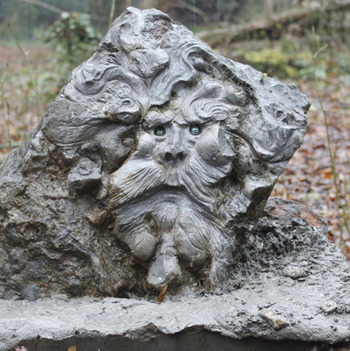 It seems that the British version of this woodland spirit evolved from the Roman God Dionysus, who was known both as lover of wine, women and song, but also a spirit who lived in the dark unknown mystery of the “underworld”. And a spirit of nature, deeply rooted in the earth. There’s a bit of him in each of us. Whoever he was and has been, the reason we included him in the Trail is that we wanted to have a strong, mythical guardian spirit to keep watch on the wood and all its animals. He sits on a small pedestal at the very top of the wood, looking down on all the paths, the trees and the bluebells. You can tell by his expression that he’s not someone you would want to mess with!